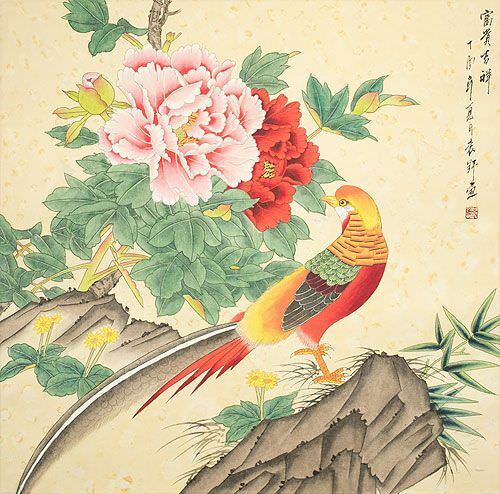 Silk/Brocade Border: 73.7cm x 72.9cm ≈ 29" x 28¾"
This painting features a golden pheasant with peony flowers. The artist added an interesting background effect with spots of brown-gold paint. I was amazed to learn that you can now Buy Golden Pheasants right here in the USA. If my backyard was not full of coyotes, I would be buying a pair of these colorful birds right now. The Chinese title is 花開富貴 or "Huā kāi fù guì". The first two characters can be translated directly as "Flowers Blooming" or "Flowers Opening". The second two mean "Riches and Honor". This phrase and these peony flowers are famous in China. The flowers themselves are sometimes called "Riches and Honor Flowers". These were the favorite flowers at the emperor's court, and concubines would often wear peonies in their hair to get the attention of the Emperor.